Let’s get going on some tips for you guys! I know I searched high and low for information on how to create the “perfect playroom.” I’m hope this is helpful. I know everyone’s playroom will look different, and that’s okay. You may have more than one kids, boys and girls, different ages etc. Look at your situation and figure out what they play with RIGHT now. Is it Legos? Pretend play? Baby dolls? School? Crafts? etc. Write down the areas you want to create and begin thinking about how you will organize this areas. Lego table? Storage bins etc. Go through all the toys and books. My piles included: Baby items and books, doesn’t play with it, plays with it, donate, pitch and send to the grandparent’s house. I say grandparent’s house, because, we have a lot of toys! Why not “share” the love? My parents have lots of grandkids that all live close, so it will be helpful for everyone. We plan on having another child so all baby items are upstairs in storage containers. That way it’s ready to go for round two OR if a baby is coming over, I can run upstairs and grab the baby toys. Easy Peasy. I found that the more I can store on the walls and off the floor, is better. Remove everything from the room. Clean it really good. Move the bigger items in first. Move them around, see how you like it and what works while utilizing the space best. I moved things around quite a bit. I’d let them sit over night, come back in the morning and see if I still liked it. Create EASY organizational centers that work for each center. Here I placed crates on the wall to hold Eva’s baby dolls in her baby corner. She can easily put back and bring down her dolls. Here’s her reading corner. These DIY gutters are amazing. They hold a lot of books and the books face forward. The books are at HER level so she can take them up and down at her convenience. I went through her books too. There’s some here, some in the living room in a basket, some in her room and on her night stand. Books are good, but I think when there’s too many, it can be overwhelming. Here is her dress up area. I have a mirror (kids love to look at themselves), hooks for her clothes and Ikea hooks and bags for her jewelry, sunglasses and hair things. Again, everything is at her level, she can easily put these things away. Her arts and crafts area is fun and functional as well. We have a lot of her art supplies in the basement. I’d rather paint down there. Here she can doodle or do as she pleases! This desk is from LampsPlus and I can’t recommend it enough. It’s beautiful, stylish and functional. I have her coloring books, notepads and stickers in the drawers. This girl loves stickers!!!! Trust me, this girl has more toys. All her large items, slides, play houses, bounce house etc. is in our basement. There’s a spare room up stairs that has some and her room. Do what works for you and get creative in your organizing. Eva enjoys playing with Legos so I created this Lego Tray that’s portable and doesn’t take up a lot of space. I’m sure if she was HUGE into Lego’s, I would create something larger. For now, this works! We also have an IKEA piece with baskets that is VERY functional. However, my theory is, if they can’t see it,they won’t play with it. Her play kitchen has a drawer that we store her “silverware” in and it came with two baskets that hold her food. On her “kitchen table” I put a large “fruit basket” that holds all her other foods! Again, I like this because she can see all the food and she knows where it all goes! My final tip is to decorate and make it fun! Your kids are playing and learning. I filled this room with art from Minted and Framebridge! I just love it all! Do you have any tips for creating a working play space? I’d love to hear about them below! 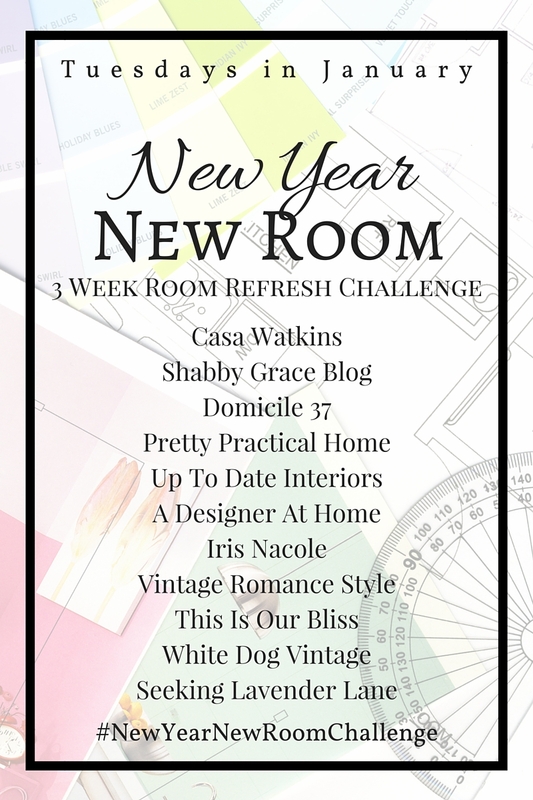 Also, don’t forget, today there’s more ROOM REVEALS for our New Year New Room Challenge! I can’t WAIT to see their rooms. Links below for more New Year New Room FUN! Looks great, can’t wait to come play! Great tips Sara! Something I really appreciate about your playroom makeover is how accessible everything is for EVA. The room is large but you still brought it down to her level which I personally like. Great tips!! I really need to put them in place in plum playroom. It’s a wreck and way too many things. I absolutely love this play room! You have some really great toy organization tips and this room would be a dream for any kids to play in. All great tips! I had to laugh about the babydoll makeup. Before I saw what you wrote, I saw the makeup and thought that looks like what Paige would do to her babies. Haircuts, too! Love how everything is organized into zones and completely agree that less toys=more play. These are great tips for planning any room, Sara! You can definitely tell the thought you put into organizing Eva’s space. I love love how this room turned out. Still in awe of how big and bright it looks! Thank you so much Brittany! Right? I can’t get over how big it feels now. I love all of the little stations. They are just the perfect amount of toys without being overwhelming and everything seems so easily accessible. A child’s dream. And the room is so stylish and pretty!! You did such a great job. Girl, thank you! I’m blushing!!! LOL I appreciate the kind words, you made my day.